Geeta Hippie clothes. Geeta Bohemian clothing. Artsy clothing for expressive women! Since 1972 Geeta of India has lead the way in creating classic gypsy hippie chick bohemian shabby chic styles for women and juniors. Handmade boutique styles at affordable prices. 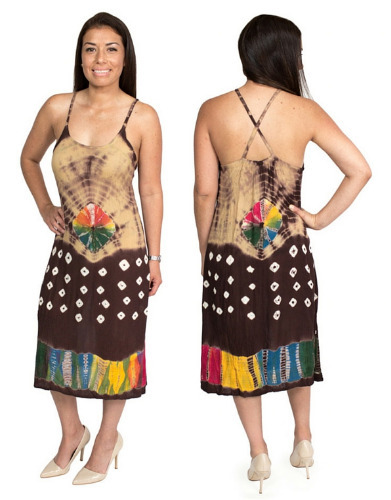 100% rayon crepe festival tie dye dress with cross-back straps. Groovy tie dye patterns. Lightweight, great for summer. Fabric has some stretch to it. Elastic across back helps to give just the right fit! Because of the handmade nature of these garments, sizing varies. The measurements here represent an average measure of this garment. Bust measurements are taken with the garment stretched. Tie Dye patterns vary from item to item because of the nature of hand dyed tie dye. The dress in the pictures is not the exact dress you will receive. Check the measurements below.